There were also CTF ZL1's built this year as test models. Some of them will be re-sold to dealers and had different VINS then a production 2014 ZL1. The CTF VINS started with E9799XXX. Nobody knows for sure how many were built. Hopefully this information will be posted soon. ZL1 Registry will post updated ZL1 Camaro Specs as soon as we find out. The first wheel option is a 10-spoke design. Polished face with a high-gloss clearcoat & ZL1 logo on wheel. 2014 ZL1 is refreshed this year only in the backend of vehicle. 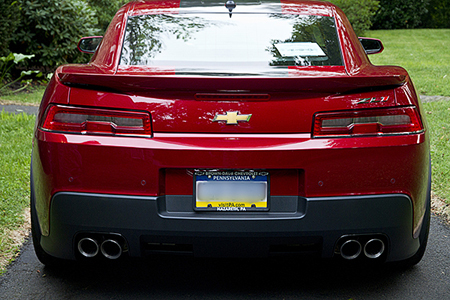 The newly changed horizontal taillights with LED give the ZL1 a different look. Also the trunk lid, spoiler, lower fascia are different for the 2014 model year. This refresh will differ the cars apart in the coming years ahead and may improve the collectibility of the 2014 ZL1.